We are working so hard to prepare for this event and to get the Anthology published in time to be available for sale on the night, that it is easy to forget how fast the time is passing. My main fear is not the moment when I have to step up to the mic and read…it’s lifting my head and seeing no audience! I hadn’t really understood how hard it is to get the message out about the event, and more importantly, to get it to the right people. We have found many friendly local businesses in Chertsey and the surrounding area who are willing to display our posters, and we owe them all a big thank you. We have organised a press release and contacted local radio. Thanks to Greg Freeman for adding it to the ‘Write Out Loud’ website. Those of us with Facebook pages have advertised an ‘event’. 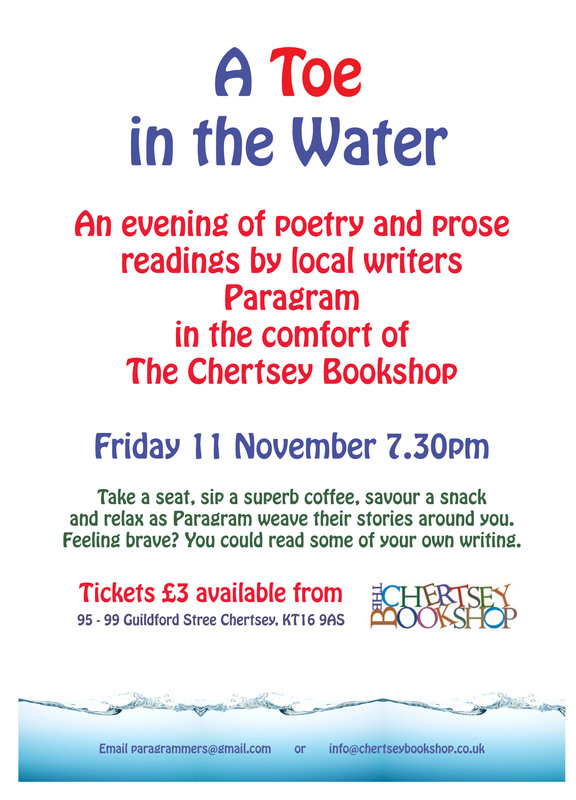 The great people at the Chertsey Bookshop are doing their best to bring the event to the public’s notice, we have pestered all the ‘contacts’ on our email accounts….so what have we forgotten? If anyone out there has an inspirational idea for publicising the evening, which I know will be funny and poignant…not to mention the cake…please leave a comment and I’ll follow it up! This entry was posted in open mic, performance poetry, performing your writing, poet, poetry, poets, Short stories, short story, social etworking, Stanza Poetry group, Surrey, Uncategorized, writer, writing, writing groups and tagged Arts, Chertsey Bookshop, Facebook, Literature, Online Writing, poetry, Social network, Write Out Loud. Bookmark the permalink.